UniEnergy Technologies, a startup commercializing flow batteries in energy storage applications, just finished off 2015 with $25 million more in its electrolyte tanks. The round B of funding was led by Japan's Orix, a $19 billion financial services firm and renewables developer, along with UET's "current private equity investor." That usually unnamed "current private equity investor" is Bolong Holding, also an investor in Rongke Power, a Chinese firm building vanadium flow batteries using an earlier type of electrolyte. UET claims that its "third-generation" flow battery system is differentiated by its Pacific Northwest National Laboratory-licensed vanadium electrolyte with "double the energy density, much broader temperature range, and 100 percent recyclability." While a sealed battery has two, typically solid, electrodes embedded in an electrolyte, a flow battery circulates a liquid electrolyte (with dissolved electroactive agents) through electrochemical cells that convert chemical energy to electricity. The electrolytes are stored externally in tanks. Power density is determined by the electrochemical cell’s area, while the volume of the tanks determines duration. This gives flow battery technology the potential for longer-duration energy storage compared to other battery types. More than 20 flow battery chemistries, including zinc-bromine, zinc-cerium, and magnesium-vanadium, have been studied -- but the most researched and closest to commercialization is the vanadium redox flow battery (VRB). Vanadium, the dominant cost in that electrolyte, is a metal mined in Russia, China and South Africa with reserves in the U.S. and Canada, and is used predominantly as a steel additive. Russ Weed, VP of business development at UET, told GTM that the company's battery works well in a microgrid, in commercial and industrial applications, and in utility applications. In a previous interview, Weed said that a typical installation will cost “somewhere between $700 and $800 per kilowatt-hour,” a figure that includes all the components needed to interconnect with the grid, adding, “When we scale up to where we’re going, we’re going to be $500 per kilowatt-hour, all in." He adds that UET “beats the competition both on dollar per kilowatt-hour and on levelized cost.” Weed said that customers should require a figure that “includes all the installation costs and components needed to operate the system and interconnect with the grid, all in" before deciding on a particular technology. 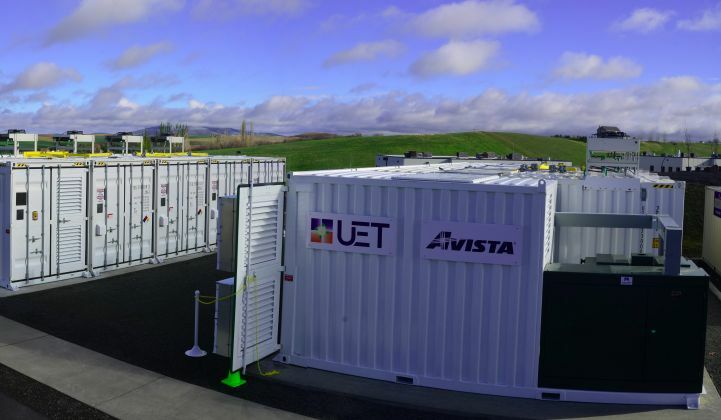 UET has built the largest-capacity flow battery in North America -- a 1-megawatt, 4-megawatt-hour vanadium redox flow battery sited at the Turner Substation in Pullman, Wash. to support Washington State University’s smart campus operations. The battery will be used for load shifting, frequency regulation, and voltage regulation. Weed stressed, “We can do peak shaving (or time shifting)...and frequency regulation concurrently." Other UET customers include Energiespeicher Nord GmbH & Co., City of New York Department of Citywide Administrative Services, Terna and Viessmann Group. Today's fleet of flow battery companies has developed some momentum in terms of capital, personnel and deployments in real-world applications. Firms such as UET, ViZn, Primus, Sumitomo and Imergy are finally installing flow batteries that pencil out financially without incentives. UET has deployed or has on order 10 megawatts/40 megawatt-hours of its vanadium flow battery. The majority of deployed capacity in the U.S. this past quarter was in the utility-scale (front-of-meter) segment, with 46.6 megawatts deployed, predominantly lithium-ion battery technology. As energy storage services mature, it is presumed that longer-duration systems will prevail and new technologies will emerge. GTM Research expects the U.S. to deploy 192 megawatts this year, tripling last year’s total. We recently published a guide to flow batteries in our initial Technology Squared column. Here's a table from that report. Source: GTM Squared article, "Long-Duration Energy Storage: Flow Battery Industry and Technology Survey"